So far I’ve never tasted a better vegan butternut squash soup. I promise you will love this soup and you’ll be thinking about it for several days. On top of that it is one of those simple recipes that can be ready within 15 minutes, provided you have butternut squash puree at hand. Who could ask for more? For your convenience I’ve also added a conversion formula (volume to weight) at the end of this blog post. The main characteristic of this rather small squash is the very high flesh content while the number of seeds is low. The butternut is often called “pear pumpkin” because of its similar shape to the fruit (see photo below). It has a sweet-buttery taste and contains a lot of Beta-carotene, which is good for skin, hair and eyesight. Just 100 g of this starchy vegetable cover 80 % of the daily beta-carotene requirement and 20 % of the daily vitamin C requirement. 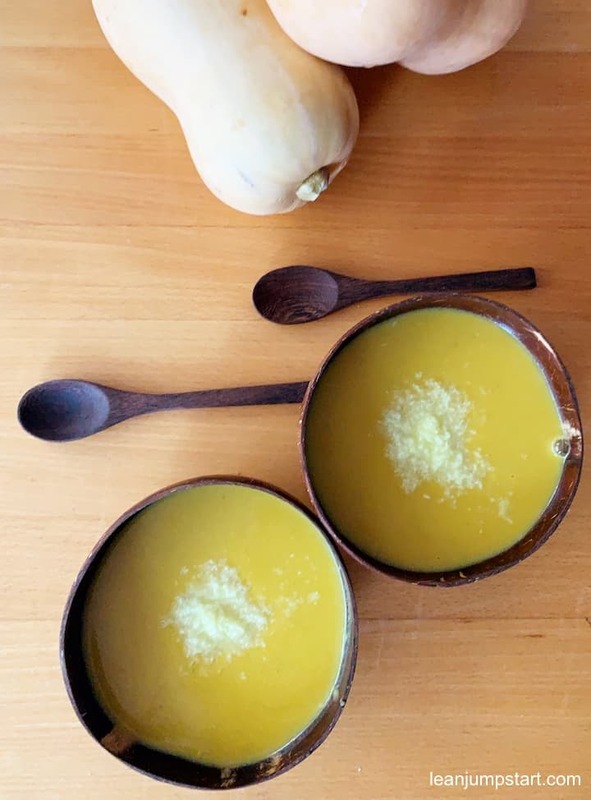 We don’t celebrate thanksgiving here in my region, but I’m convinced that this dairy-free soup could be a perfect thanksgiving starter (just double ingredients). As said, an important base for this vegan recipe is cooked butternut squash. There are several ways how you can get your squash puree, dependent on how much time you have. Do you remember my yummy baked squash recipe I shared with you 2 weeks ago? The vegetable was so huge (4 lbs) that I could freeze half of the cooked pulp, which then came handy for this recipe. I’d really recommend going the extra effort and roast the squash to make your own puree in advance. You can always freeze it for later use, e.g. Thanksgiving… Check out my baked butternut recipe. Did you know that Whole Foods market sells organic frozen butternut cubes? How convenient is that?! If I would have a Whole Foods market in my area and the price is attractive, I’d surely buy several packages of frozen vegetables, to save me time in my kitchen. The truth is, here in Germany it is even sometimes hard to get fresh butternut squash…On the other hand Red kuri squash (Hokkaido pumpkin) is dominating the market, which is by the way very yummy too and you can even eat the skin. Update on November 2018: Finally my wish came true. Only recently I’ve spotted frozen butternut squash cubes at a German discounter which means a huge time savement for me. If you have a microwave you can follow this approach, yes I know it IS tedious… Wash, cut, seed, peel and cube the starchy vegetable. 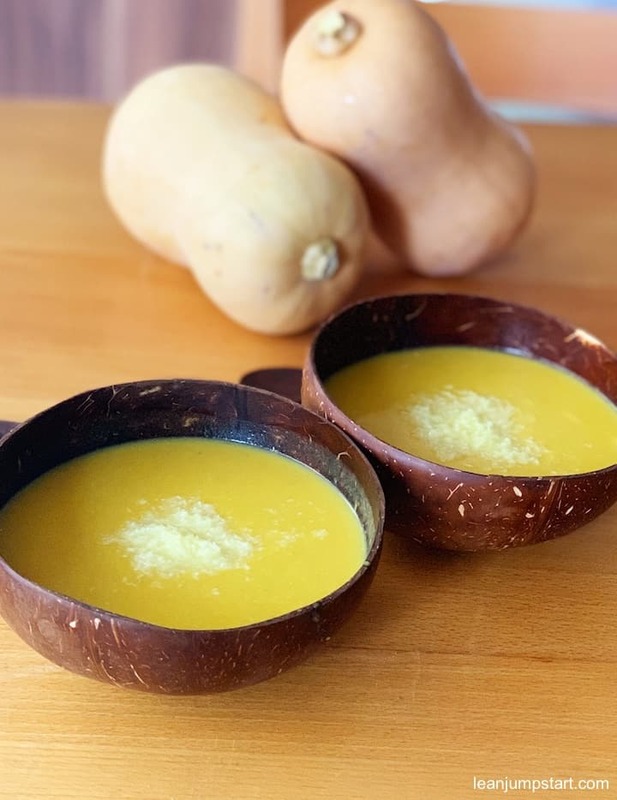 (Don’t miss my tip on how to cut butternut squash at the end of this article) Arrange chunks on a plate, add around 2 tablespoons of water, and cover. Microwave until completely soft. Cooking time depends on the microwave, in my case it takes 8-9 minutes. Allow to cool completely and then blend to be used in the soup! I’ve seen that in the US you could also buy organic, sugar-free, canned butternut puree by brands like e.g. Farmer’s market. Full disclosure here, as I never tried it, but cooking with pumpkin cans seems to be quite common in the US. By the way did you know that most cans of pumpkin puree contain winter squash (e.g. butternut squash). So in case you have some pumpkin cans sitting in your pantry, check the ingredient list – you might be surprised to find butternut on it. In a large pot with hot olive oil sauté onions, garlic and celery for three minutes, stirring occasionally. Add puree, vegetable stock, ginger and curry powder. Bring it to a boil, then reduce heat. Purée with a hand or immersion blender. You might want to work in batches or you can also use a food processor. Feel free to add coconut flakes or pumpkin seeds as garnish. 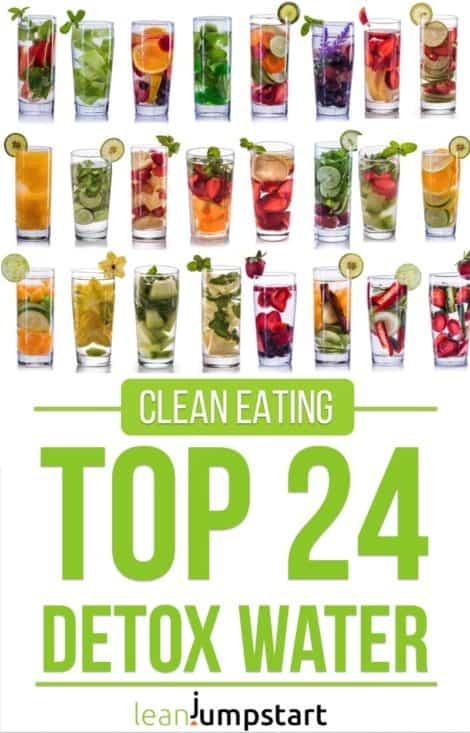 If you love my easy soup recipe and also enjoy simplified recipes then check out my clean eating soup collection for more inspiration! But wait, I don’t want to leave you hanging, if you are forced to cut this bell-shaped vegetable on your own. Merissa from Little House Living shares an easy way how to cut butternut. Click here! These are my own experiences, yours may vary. Rule of the thumb: The larger the vegetable the better the proportion of flesh to seeds. What a delicious starter option for Thanksgiving. I love a bowl of butternut squash soup! Absolutely, Binto. But I could even eat this type of starchy soup all year around. 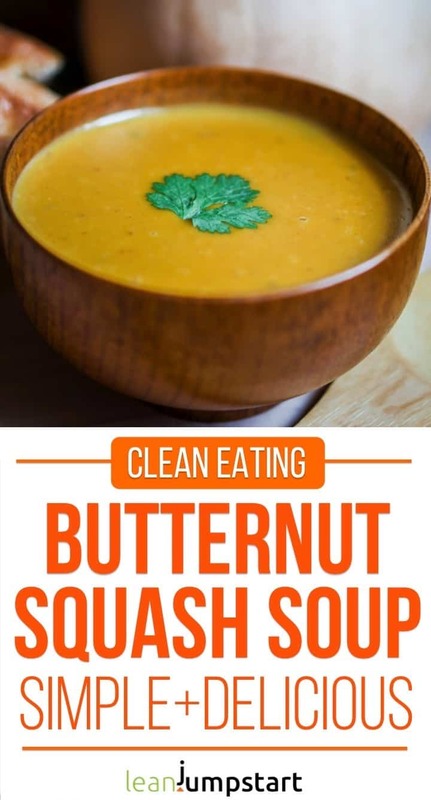 I love this butternut squash soup! What an amazing flavor and so easy too! Yes, it’s true. This is such a simple and delicious soup, I could eat not only in autumn or winter time. This soup looks super easy and full of ingredients my family loves. Looking forward to trying soon. Looks VERY tasty! Thank you Mary. Yes with awesome ingredients you can never go wrong. Soup on! This looks so comforting and delicious! I can’t wait to try it! Thanks Taylor. Yes, for me this soup with slices of whole grain bread is a typical soul food which happens to be much healthier than the typical comfort food.